Diagnosing Hepatitis C before it becomes chronic can prevent damage to your liver. That’s why it’s imperative to be aware of not only what early symptoms of Hepatitis C to watch out for, but to also know which activities pose a high transmission risk for this deadly virus. Hepatitis C is a complicated beast – invisible, sneaky, dangerous and tenacious. The microscopic viral particles known as Hepatitis C are cause to one of today’s largest healthcare epidemics, infecting an estimated 71 million people globally. One of the trickiest aspects of the C virus is detection, with a majority of affected people only learning they have this disease after several decades of infection. Unfortunately, the longer this virus lingers in your liver, the more damage it can wreck. Knowing what early symptoms of Hepatitis C to look out for can encourage those who may have been exposed to get tested – and, if infected, get treated. The reason it’s dangerous is because most people have no idea they have it. Many people often find out they have Hep C only after routine bloodwork indicates a problem with liver enzymes. If there is no other possible cause for these abnormalities, an astute physician may order a Hepatitis C test to rule it out. Unfortunately, this rarely occurs during the early stages of infection. More commonly, a Hepatitis C diagnosis happens after a person has had this virus for many years – and liver damage can be extensive. If it goes on long enough, the damage can lead to liver failure and/or liver cancer. Unless specifically tested for this virus, detecting Hepatitis C presents a challenge because its symptoms are vague – if there are any at all. Acute Hepatitis C is frequently described as a mild illness lasting a few weeks to several months. Although some people’s immune systems are able to fight off and rid their body of the Hepatitis C virus, approximately 85 percent of those infected go on to develop a chronic illness. Technically, the first six months a person has been infected with Hepatitis C is considered to be the acute phase. However, a majority of those who have been exposed go on to develop chronic Hepatitis C – a progressive liver disease. Experts estimate that only 25 to 35 percent of those infected with HCV display symptoms during the acute phase. If these early symptoms of Hepatitis C manifest, they are typically present for just a few weeks after the virus’s onset. Because the symptoms can easily be mistaken for a mild stomach flu, food poisoning, dehydration, eating something you are allergic to, menstrual cramping – and a number of other common occurrences, it is easy to see why so many people miss an acute Hepatitis C diagnosis. For the majority of immune systems that are unable to mount a strong enough response to eliminate Hepatitis C from the liver, this infection becomes chronic. The longer the Hepatitis C virus resides in the body, the more inflammation and damage can be done to the liver. Over time, soft, healthy liver tissue accumulates scars from the virus and becomes fibrotic. Known as liver fibrosis, this is a sign that liver disease is progressing. If inflammation and liver cell damage continue, the liver can become cirrhotic. Characterized by the hardening and shrinking of liver tissue, liver cirrhosis is an advanced stage of liver disease. Once a person has severe fibrosis or cirrhosis as a consequence of Hepatitis C infection, more complex symptoms emerge. Since the symptoms of acute Hepatitis C are so vague, more information is needed to suspect this virus as the cause of fatigue and bellyache. Symptom time frame – In those individuals who develop symptoms from acute Hepatitis C infection, the average time from exposure to symptoms ranges from 2 to 12 weeks. Contagious – Even if a person with Hepatitis C has no symptoms, he or she can still spread the Hepatitis C virus to others. How you get it – The Hepatitis C virus is blood-borne, meaning contaminated blood must enter your bloodstream for infection to occur. It is important to understand how the virus is transmitted to be able to recognize what early symptoms of Hepatitis C could be. The Hepatitis C virus itself is small and resilient. A microscopic amount of blood can transmit the virus – and it can live outside of your body in open air for at least four days. Inside of a syringe, the virus can live for several weeks. As such, sharing injection drug equipment presents the highest risk for Hepatitis C transmission. Equipment for preparing and injecting drugs is shared. This includes steroids. Items could include needles, syringes, cookers, water, filters, tourniquets and alcohol swabs. Equipment for smoking or snorting drugs is shared. This includes crack pipes and cocaine straws. Tattoo or body-piercing equipment is shared. Both needles and ink can transmit the Hepatitis C virus if not single-use or properly sterilized. 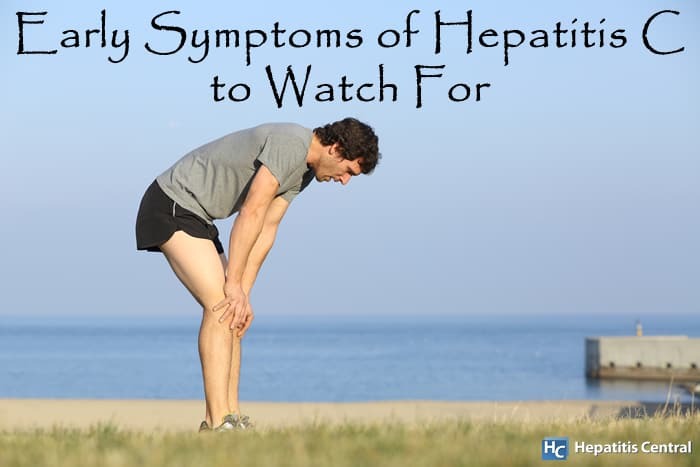 The Hep C virus can be elusive, so simply knowing what the early symptoms are is insufficient. Since many with an acute infection are asymptomatic, being aware of the most common modes of transmission could help someone who is feeling under the weather recognize the potential that their malaise might be due to Hepatitis C infection. https://labblog.uofmhealth.org/rounds/early-detection-early-treatment-for-hepatitis-c, Early Detection, Early Treatment for Hepatitis C, Retrieved September 29, 2018, Regents of the University of Michigan, 2018.
https://www.catie.ca/en/practical-guides/hepc-in-depth/what-hep-c/what-is-risky, How Hep C Transmission Happens, Retrieved September 30, 2018, Public Health Agency of Canada, 2018.
https://www.cdc.gov/hepatitis/hcv/cfaq.htm, Hepatitis C Questions and Answers for the Public, Retrieved September 29, 2018, US Centers for Disease Control and Infection, 2018.
https://www.healthline.com/health/hepatitis-c/symptoms#symptoms, What are the Symptoms and Warning Signs of Hepatitis C?, Retrieved September 29, 2018, Healthline Media, 2018.
https://www.news-medical.net/health/Early-and-Late-Symptoms-of-Hepatitis-C.aspx, Early and Late Symptoms of Hepatitis C, Joseph Constance, MA, Retrieved September 29, 2018, News-medical.net, 2019.
http://www.who.int/news-room/fact-sheets/detail/hepatitis-c, Hepatitis C, Retrieved September 29, 2018, World Health Organization, 2018.